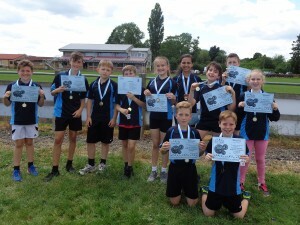 Swavesey and Hatton Park primary schools came out on top at the South Cambs School Sport Partnership tag rugby mega fest held at Cambridge Rugby Club earlier this week. Over 400 children took part in the event which involved a tag rugby competition, and running alongside that a series of fun tag rugby activity stations where children could practice their skills and develop their game play in a more relaxed environment. 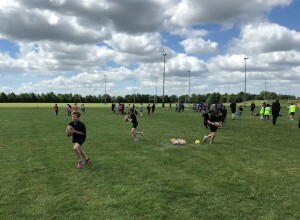 With an entry of twenty one schools the event was split into two with half of the schools taking part in the morning before a new set of schools arrived for the afternoons activities. 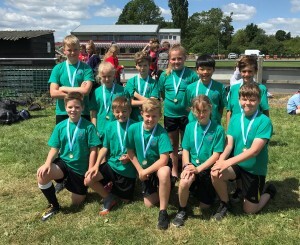 In the morning event teams of year 5/6 children from The Meadow, Swavesey, Fowlmere, The Vine, Bassingbourn, Harston & Newton, Linton, Barrington & Petersfield contested the competition which was played in round robin format with all teams playing each other in their group. Swavesey won all four of their matches to finish top of their group and qualify for the final where they faced Linton Heights who had won 3 and drawn 1 of their matches. The final was extremely close with tries being scored at either end but it was Swavesey who claimed victory by 1 try to leave Linton Heights as runners up. 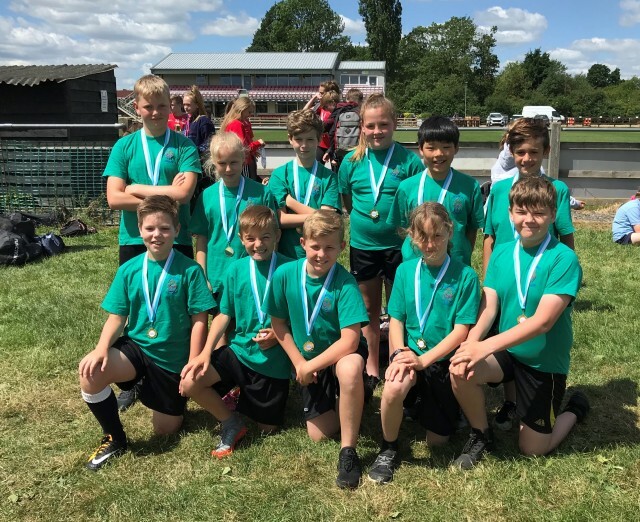 The team from Petersfield won the ‘Spirit of the Games’ award for demonstrating good sportsmanship throughout the event, even when decisions didn’t go their way. 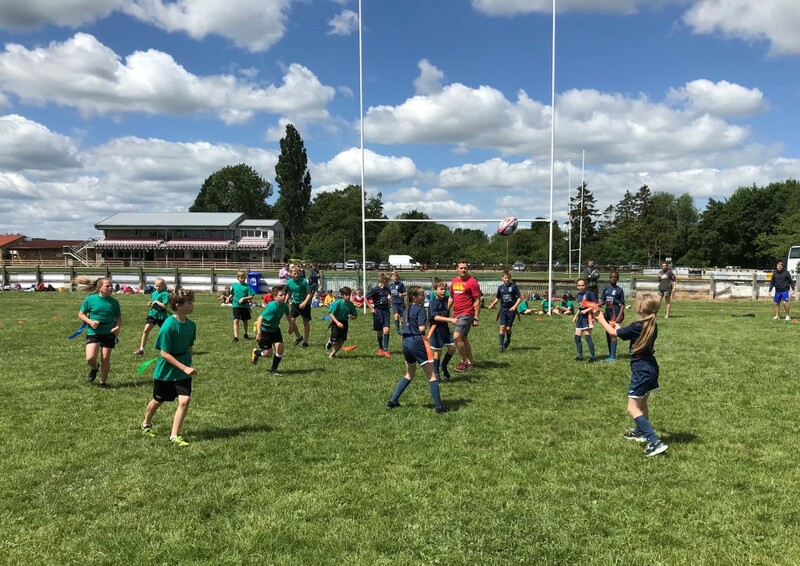 In the afternoons competition it was the teams from Jeavons Wood, Pendragon, Cottenham, Hatton Park, Elsworth, Histon & Impington Juniors, Steeple Morden, Caldecote, Haslingfield & Bar Hill schools that took to the pitches. Again there were some fast paced and competitive matches in the round robin stage but it was the teams from Hatton Park and Histon Juniors who won 4 from 4 of their matches to make it through to the final. The final proved to be a high scoring affair with Hatton Park coming out on top with an 8-5 victory. Hatton Park with their winners medals. Haslingfield Primary School were recognised for their good sportsmanship and great determination and presented with the ‘Spirit of the Games’ award. Groups of 16 children from fourteen schools took part in the festival activities whilst the matches were taking place and they got to develop their rugby skills, teamwork and communication in games such as rugby rounder’s, end ball, team tag and hare and hounds before finishing in time to cheer on their school team in their final matches. Action from one of the festival activities. Sports leaders from Swavesey Village College refereed all of the matches and oversaw the results table throughout the day whilst another team of leaders from Melbourn Village College organised and led the festival activities. Partnership Manager, Claire McDonnell said; “The year 9 sports leaders from both schools did an incredible job, they are new to the leadership role but they showed great maturity and initiative and undertook their roles with growing confidence throughout the day, we were delighted with them.